Can you say VIEWS! This installation in San Marcos, CA features a Remote Controlled Motorized Retractable Awning with Sunbrella fabric. This home has an amazing view and the customer did not want obstructions in the form of upright wood posts or umbrellas to get in the way. This Motorized Retractable Awning is the perfect solution, it provides sun shade when they need it and retracts back and out of the way when they don't. The awning comes equipped with a wind sensor so they don't need to worry about wind being an issue either. Established in 1971, SunMaster Products, Inc., is a family owned and operated business which has provided San Marcos and all of San Diego County with exceptional quality sunshade systems at the lowest prices possible for over 40 years. 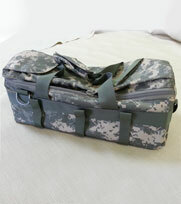 In addition, we have also offered expert fabric die cutting and production sewing services. Over the years, we have provided our products and services for tens of thousands of satisfied residential, commercial, industrial, and institutional clients, and have a well-established reputation throughout our service area. At SunMaster Products, we can custom design, handcraft, and install fixed and retractable awnings, canopies, solar screens, sunroom covers, skylight shades, patio cover shades, drop roll curtains, and blackout shades, and we offer these products to San Marcos in a wide selection of fabric colors, patterns, and types. Our retractable sun shade systems are available in both manual and motorized designs, and we feature Sunbrella fabrics and Somfy motors and control systems, offered with 10 year and 5 year warranties, respectively. Call the experts at SunMaster Products today, for comprehensive sun shade system design and installation, and professional fabric die cutting and contract sewing services. We provide free consultations and estimates to San Marcos and all of San Diego County, and are licensed, bonded, and insured. Over the years, since we began our business in 1971, we have performed our expert fabric die cutting and production sewing services for tens of thousands of satisfied San Diego County businesses and manufacturers. And these clients appreciate the convenience of having a full service contract sewing workshop which is locally owned and operated, and offers very competitive pricing. Trust the professionals at SunMaster with your San Marcos fabric die cutting or production sewing project. Contact us today. 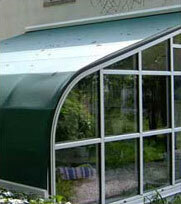 Depend upon SunMaster for energy saving retractable awning systems. At SunMaster, our retractable awning systems empower San Marcos home and business owners to regulate the amount of thermal gain which enters their home and business interiors from outside. When the sun's rays directly strike windows and glass doors (even those which are well-insulated and considered highly energy efficient), a significant amount of heat transfer occurs. However, by keeping retractable awnings extended in warm weather, and conversely, by retracting these same awnings during cold weather (thereby allowing the sun's warming rays to shine in through windows and glass doors and assist in the the interior heating process), retractable awnings become a very practical tool for regulating the temperature of indoor spaces. In fact, it has been found that home and business owners who install retractable awnings over their windows and glass doors which are subject to direct sunlight average a 35% savings on their summer cooling and winter heating bills. At SunMaster, our expertly-designed commercial awnings are certain to add a sophisticated architectural accent to the facade of any business or institutional facility, increasing your business's visibility and brand name recognition to potential patrons. Our commercial awnings are available in a limitless range of designs, from traditional to contemporary, including: standard slope, concave, dome, long-dome, quarter barrel, and open-ended styles (such as spear-head and scroll arm awnings). Moreover, our hand-painted custom graphics are done in an extremely durable fabric grade latex-based paint which is highly resistant to peeling and flaking, and will not fade over time. They are available in an extensive selection of fabric types and colors, including the full line of Sunbrella and Dickson fabrics, and in a choice of metal framework types, including aluminum, stainless steel, and galvanized steel. Trust the professionals at SunMaster with your San Marcos awning or canopy project. At SunMaster, we are known for our unique custom designs, affordable pricing, and our high quality products. Our fixed awnings and canopies can be seen accenting homes, businesses, industrial facilities, and institutions throughout our San Diego County service area. We are a family owned and operated business, and since we entered the awning industry in 1971, we have serviced tens of thousands of satisfied clients, who appreciate the great value that we offer, and often refer our products and services to their business associates, family members, neighbors, and friends. Join our thousands of satisfied customers, and call the experienced professionals at SunMaster Products today, San Marcos. Sunrooms and skylights are a very effective means of admitting natural light into San Marcos residential and commercial structures, but at some times of the day and year, they can admit more sunlight than is desired, and also become a source of unwanted thermal gain. At SunMaster, our exceptional quality skylight and sunroom shades can effectively resolve this issue, helping to promote a more comfortable interior environment for our valued clients. Our sunroom and skylight shades are available in an extensive selection of fabric types, colors, and patterns, including Sunbrella fabrics, which are backed by a 10 year warranty. In addition, our sunroom and skylight shades can be designed to cover both flat and curved glass skylights; as well as curved roof, gable roof, and single slope roof sunrooms. Call us today. Drop roll curtains can keep San Marcos patios and decks warm in the winter and cool in the summer, promoting maximal outdoor comfort year round for your family and guests. They are available in an extensive selection of fabric colors and patterns, to complement your home or business's decor perfectly, and are ideal for adding privacy to your outdoor living space. Call us today for a free estimate. 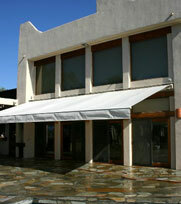 Awning recovers are a cost-effective way to renew the look of your old, worn or damaged awning. At SunMaster, we offer our awning recovers in an extensive selection of extremely durable fabric types, patterns, and colors, and are certain to have the ideal fabric to complement the facade of your San Marcos residential, commercial, or institutional property perfectly. Our awning recovering services save our valued clients up to 60% of the cost of complete awning replacement. 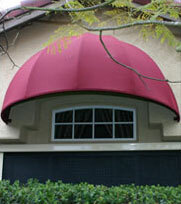 Are the awnings at your home or business looking a little weathered? Avoid the expense of installing new awnings by taking advantage of our professional awning recovering services. Contact us today. We accept all major credit cards, and are licensed, bonded, and insured. At SunMaster, our extremely durable tarps and equipment covers can be sized to fit any type of San Marcos equipment or machinery, and provide a very effective shield against the elements. They are offered in a choice of fabric types, patterns, and colors, including Sunbrella solution dyed woven acrylics; and Weblon, Vanguard, and Ferrari 100% waterproof vinyl coated polyester. Sunbrella fabrics come in over 350 colors and patterns; and Weblon, Vanguard, and Ferrari vinyls are available in many solid colors, and provide 100% UV blockage. Sunscreens and solar screens are available in both interior and exterior mounted systems. They help to reduce heat transfer through windows and glass doors, filter the sun's glare, and block harmful UV rays from entering your San Marcos home or business's interior. 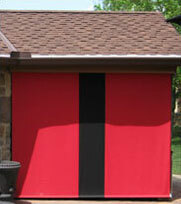 They protect indoor furnishings from fading, and can provide privacy without blocking a scenic view. 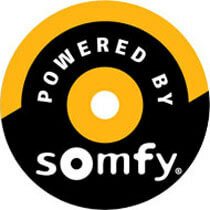 In addition, their heat blocking qualities result in reduced air conditioning usage and significant energy savings. In fact, sunscreens and solar screens can pay for themselves over time when these increased energy savings are taken into account. Call SunMaster Products today, for exceptional quality sun shade systems, fabric die cutting, and production sewing services. We accept all major credit cards, and are licensed, bonded, and insured.